Product #22116 | SKU 16240743 | 0.0 (no ratings yet) Thanks for your rating! Designed specifically for the Fujifilm X-series of interchangeable lens cameras with APS-C sensors, this Fujifilm 18mm f/2.0 XF R Lens is a lightweight, compact wide-angle "pancake" lens equivalent to 27mm in 35mm format. The very fast, bright f/2.0 maximum aperture makes shooting in very low light possible, and provides pleasing bokeh (the out-of-focus portion of a photo) with its 7-blade aperture design. This is a terrific lens for street photography, landscapes, and interiors. 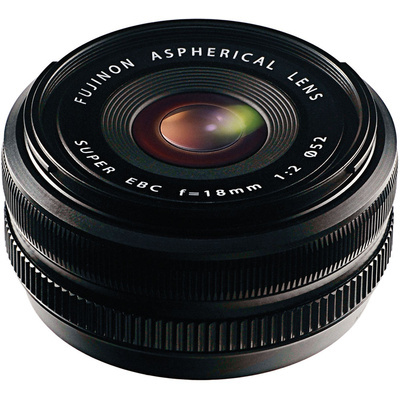 Lightweight wide-angle 27mm (equivalent in 35mm format) "pancake" lens that focuses to 7.08"